I’m pretty obsessed with strawberries these days. When the season shifts and the market is flooded with new fruit, it’s impossible not to get mesmerized. Then I spotted some fresh rhubarb a couple of days ago and boom, I had to jump in. Even though one of my very favorite things is Strawberry Rhubarb Pie, I had some leftover cream cheese from another project so my senses wandered toward some sort of strawberries and cream thing. Since, along with strawberries, it’s hard to resist a little slice of good cheesecake, I made an ice cream that has some of the same qualities as a good cheesecake. It’s a delicious but plain ice cream with a spot of lemon juice and vanilla to enhance the flavor. 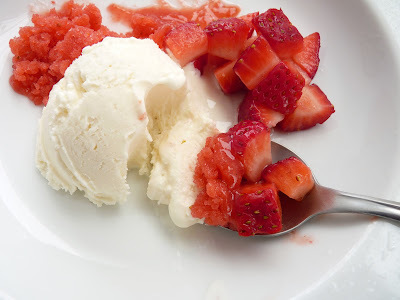 Instead of adding strawberries and rhubarb to the ice cream base, I went with a granita to contrast the creamy with an icy tart fruit flavor. I’ve also added some diced and sugared strawberries to bring another element of texture and freshness to the plate. I like the way everything co-mingles without being overly rich. The ice cream is great on its own but is also the sort you can pair with lots of different fruit and cookies. I’m thinking a fresh blueberry compote or a raspberry coulis would be fabulous or some fresh cherries roasted in balsamic when they roll in sometime in the next few weeks. A parfait of layered ice cream, berries and crushed shortbread, graham crackers or cocoa wafers would also be a playful dessert. It’s spring - get your strawberry rhubarb on! 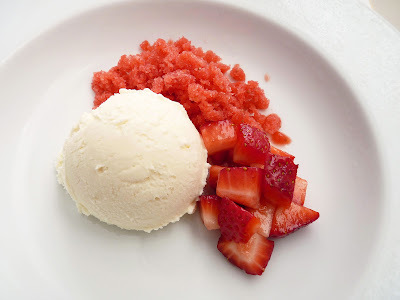 - This is a simple ice cream made in a food processor. The cream cheese and small amount of heavy cream make for a good creamy mouthfeel without the need for egg yolks. - The amount of sugar in the granita is going to depend on the ripeness of your fruit. You may want to add a bit more once you’ve tasted the puree but too much sugar and the granita won’t freeze. - Use a shallow container for the granita so it has more surface area and will freeze evenly. For the ice cream, place all the ingredients in the bowl of a food processor and process until smooth and well blended. Taste and adjust for lemon juice and salt. Pour into an airtight container and chill thoroughly, preferably overnight. Churn according to your ice cream machine’s directions. Pour into an airtight container, press a piece of plastic wrap into the surface, cover and place in your freezer to firm up. For the granita, trim and cut the rhubarb into 1/4" pieces. Bring water and sugar to a boil. Lower the heat, add rhubarb, vanilla bean seeds and pod (if using), orange zest and simmer until tender, about 10 minutes. Take off the heat and cool. Remove vanilla bean, if using. Hull and slice the strawberries. Place them in the bowl of a food processor with the cooled rhubarb. Process until the fruit is pureed. Add lemon juice. Strain though a fine-mesh sieve and discard the solids. Pour into a shallow airtight container, cover and place in the freezer. After about 2 hours, take the tines of a sturdy fork and scrape the surface of the granita to form slushy icy crystals. Place back in the freezer and repeat again in an hour or so. For the strawberry garnish, slice or dice strawberries and place in a bowl with a sprinkle of sugar. Toss thoroughly. 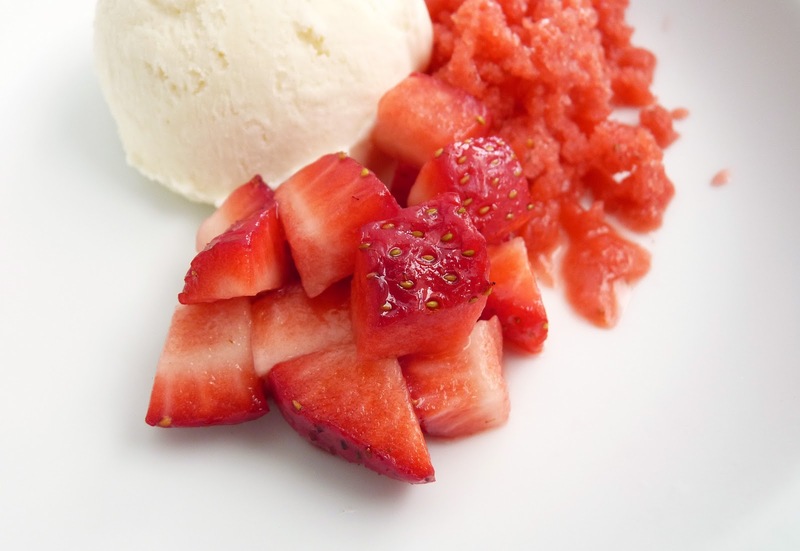 Serve a scoop of ice cream with a dollop of granita and strawberries. Bright red spring strawberries have found their way to our markets just about everywhere. Time to break out the seasonal shortcakes, pies, angel food and the ice cream machine! Rhubarb cannot be far behind. For a little diversion, I'm going in a different direction here. 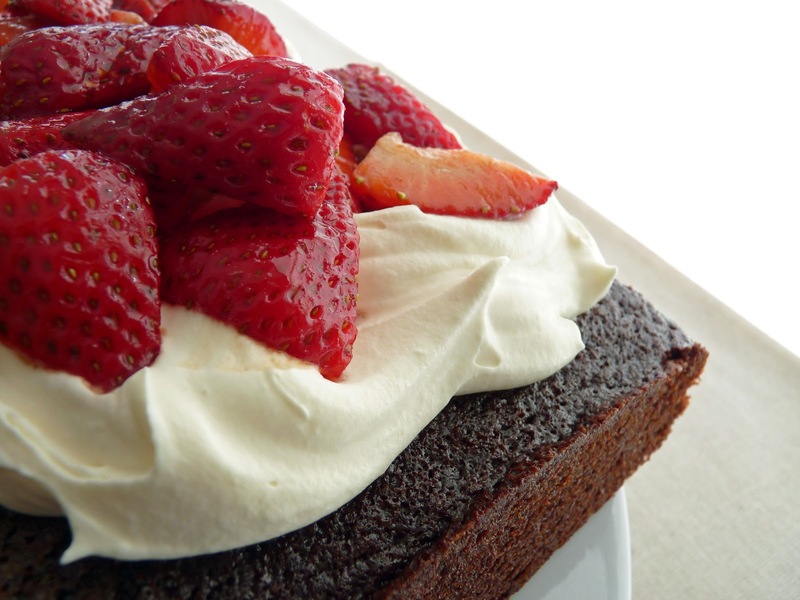 I've placed fresh strawberries doused with brown sugar and balsamic atop a soft chocolate cake that's been dolloped with clouds of whipped cream. The cake is made with oil for extra moisture and is a simple mix in a bowl. A good measure of cocoa lends richness and depth that stands up to the bracing acidity of the strawberries. 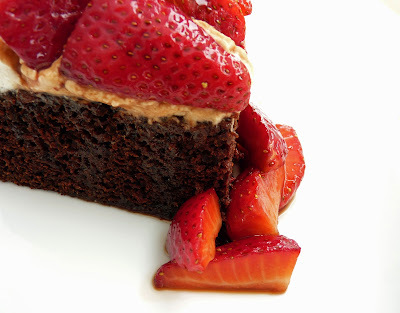 It hits all the right dessert notes for flavor, gooey lusciousness and, of course, chocolate. If you're seeing lots of good strawberries in your neighborhood, it's time to dig in! - A note about cake flour: The important difference between cake flour and all-purpose flour is the protein content. When flour protein is hydrated, strands of gluten develop. The protein content of cake flour is about 8%; the protein content of all-purpose flour is about 10% - 12%. So for cakes, lower protein flour means a more tender texture. If you don't have access to cake flour, you can make your own with a ratio of cornstarch to all-purpose flour. When added to all-purpose flour, cornstarch acts to inhibit the formation of gluten. The formula for substituting all-purpose flour for cake flour: 1 cup cake flour = 1 cup bleached all-purpose flour minus 2 tablespoons + 2 tablespoons cornstarch. After measuring, sift the flour to fully distribute the cornstarch before using it in your recipe. - I used natural (undutched) cocoa powder for the cake. To "bloom" the flavor, I mix it with hot water before adding it to the batter. - The amount of sugar and balsamic you use for the strawberries will depend on their ripeness. - Add a dab of sour cream to the whipped cream and substitute brown sugar for a variation that goes well with strawberries. Preheat oven to 350 degrees. Lightly grease a 9" square pan and line with parchment, leaving an overhang on two sides. Sift the cake flour, baking soda, salt and cinnamon. Whisk the cocoa and hot water together until thoroughly blended and smooth. Whisk together both sugars, oil, eggs and vanilla and blend well. Add the cocoa mixture. Stir in the dry ingredients in 3 additions, alternating with the buttermilk and beginning and ending with the dry ingredients. Pour into the prepared pan and gently tap the bottom of the pan on the work surface to remove any air bubbles. Bake until a toothpick tests with a few moist crumbs adhering, about 28 minutes. Place on a wire rack to cool for 10 minutes. Run a thin bladed knife around the edges and gently lift out the cake. Cool completely. Hull and slice the strawberries and place in a bowl with the brown sugar and balsamic. Toss to thoroughly coat and set aside to macerate. Whip the cream with the sugar and vanilla to soft peak. 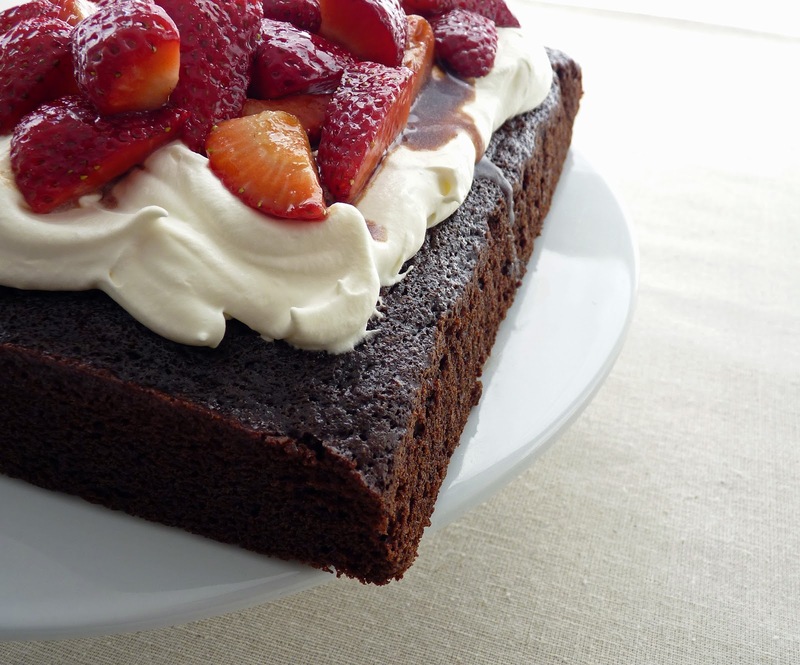 To serve, spread the cream on top of the cake and top with strawberries. 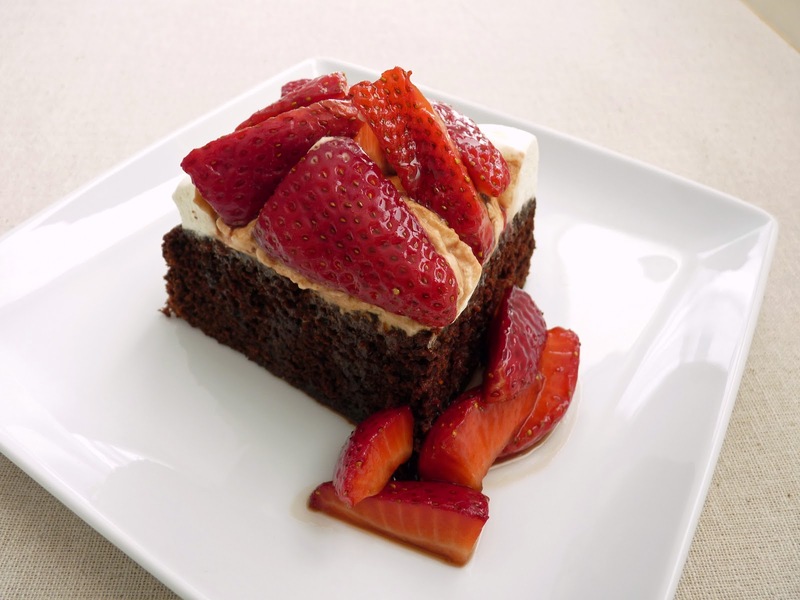 Alternatively, plate the slices of cake and garnish with a dollop of cream and a serving of strawberries and juices. Chocolate’s rich, dark, earthy flavor is suited to so many partners. It’s terrific with nuts, salt, olive oil, liqueur, brandy or rum and some types of dried and fresh fruit and red wine. Espresso and spice are a couple of my favorite pairings. Lately, my work seems to be going in the direction of cookies. They’re so much fun and a favorite for most, handy for a small bliss bite when you don’t want to make a serious commitment to a piece of pie or cake or an indulgence in ice cream. And I’ve been focusing on testing recipes that can be put together in no time in the food processor so there’s no excuse to have some fun every now and then. And they can always be stored in your freezer for those times when you want just a taste. I didn't really grow up eating cookies besides graham crackers and the Sunshine raisin biscuits I had at my grandmother’s house. So I have a lot of experimenting to do. But it’s the kind of study I gladly embrace considering the reward I get as I gladly give away all the results. Today's cookie is all about cocoa, spices, espresso powder and an extra swipe of melted chocolate. This cookie is crisp and has just enough of a hit of each of its elements. I’d suggest a piping hot cup of coffee to go along. - I used natural, not dutched, cocoa powder in this recipe. - You can re-roll scraps. Just layer them as you go rather than gathering them up into a ball. - A round flat pizza pan is handy for chilling cookie dough that’s been rolled out. 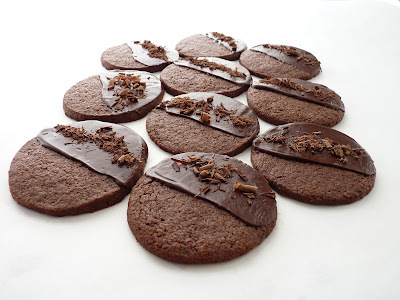 - Using a vegetable peeler, I shaved about 1 oz chocolate for garnish. They would also taste great with finely chopped nuts or without any garnish at all. Place flour, sugar, cocoa, baking powder, espresso powder, spices and salt into the bowl of a food processor and process to combine. Cut the cold butter into 1/2” pieces and add. Pulse until the mixture looks like coarse meal. Combine the milk and vanila and add. Pulse just until the cookie dough starts to clump and holds together when pinched. Place half the cookie dough on a piece of plastic wrap and gather together into a disc. Place another piece of plastic wrap on top of the dough and roll out to a 10 1/4” circle about 1/8” thick. Slide onto a pan and place in the refrigerator. Repeat with second half of dough. Chill until firm. Preheat oven to 350 degrees. Line baking pans with parchment or silpats. Remove plastic wrap from both sides of cookie dough, leaving one piece underneath. 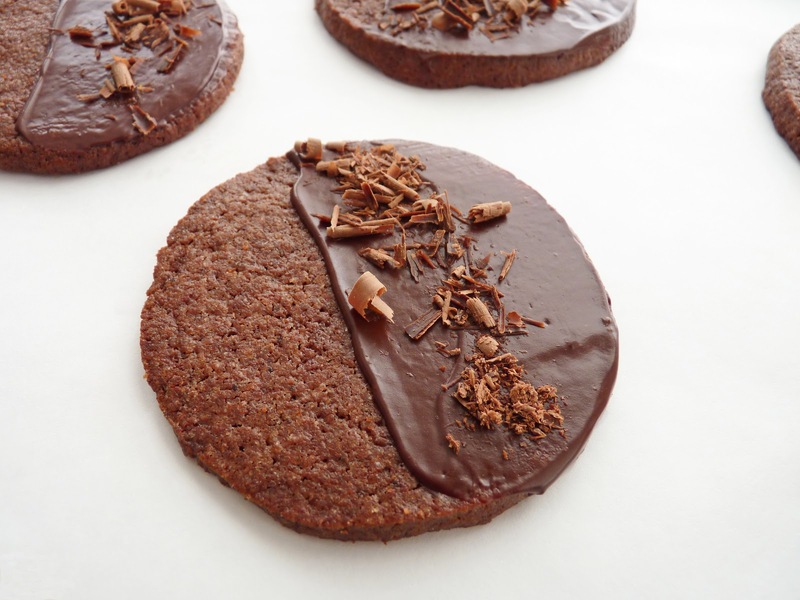 Cut out cookies using a 2 1/2” cookie cutter and place 12 per prepared baking pan. Bake cookies until the edges are firm, about 14 minutes. Cool completely. Melt butter and chocolate together in a heatproof bowl over a saucepan of barely simmering water, making sure the bottom of the bowl isn’t touching the water. Stir to combine. 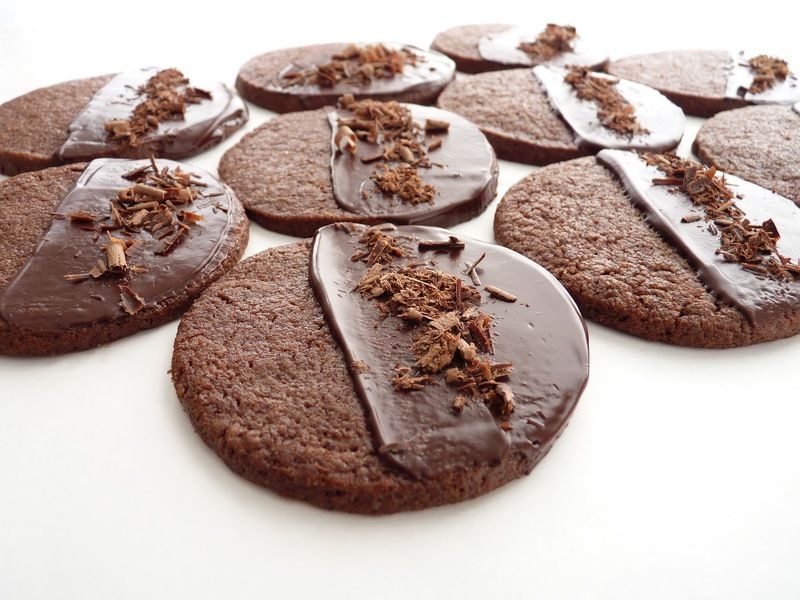 When cookies are cool, spread a layer of chocolate over half the cookie. Garnish with shaved chocolate. Set aside to dry. Spring has definitely sprung. There are tulips and asparagus everywhere! The evening light is back and the street scenes are transformed. There are the occasional showers that we know will bring us May flowers. Strawberries have arrived but I'm holding off just a bit to see if they get slightly smaller and sweeter. And then of course there is lemon. 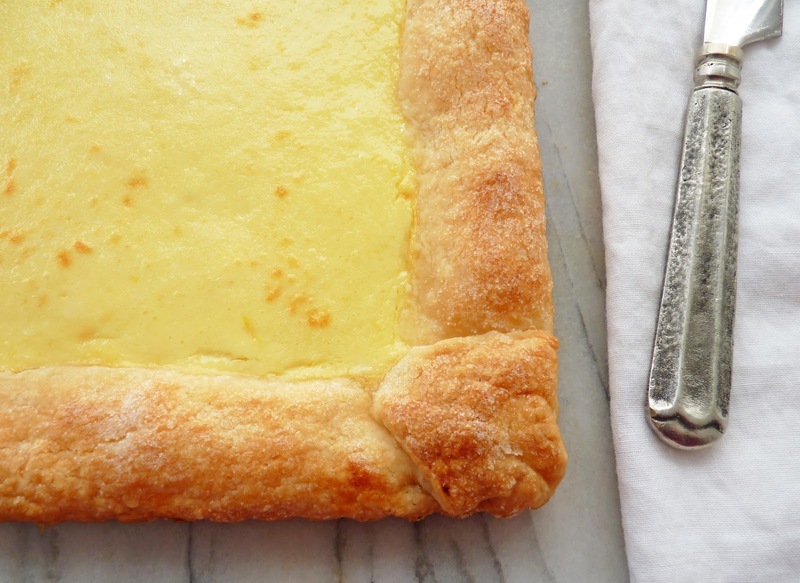 This tart is the ultimate in simplicity, the kind of dessert I always associate with spring. It's a very light bite with lemon overtones and will pair nicely with all the fresh fruit of the season (think strawberry rhubarb compote). Or it can be served plain with a nice glass of Beaumes de Venise, Semillon or Monbazillac. It's basic but satisfying when you want just a hint of dessert. 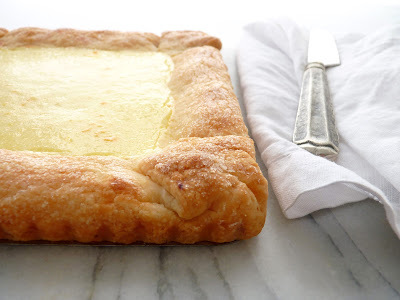 The lemon filling is an equal blend of cream cheese and ricotta and forms a thin layer inside a flaky crust, so you're almost getting a fairly equal bite of both. It's subtle and not too sweet, perfect if you're looking for something to crown a light summer meal in the twilight of evening. - The pastry dough comes together almost instantly. Check it as you go to be sure you're not overmixing. It's done when the dough looks a little bit like small curd cottage cheese. When you gather it together to wrap, it smoothes out. - The pastry dough can be made 1 - 2 days ahead and chilled. Any longer than that and it starts to discolor and turn grey. - Room temperature cream cheese makes it easier to blend with the other ingredients. - Whisk the filling just long enough to completely combine without loosening the cheeses too much. - Be gentle when you're folding over the pastry dough onto the tart to form the border so it doesn't sink into the filling. It's easiest if you fold over all 4 sides first and then fold the tucked corners over the top. - I bake this for 25 minutes at 375 degrees to set the cheese filling and then raise the temperature to 400 degrees for 10 minutes to brown the crust. But each oven is its own beast, so check it at 25 minutes to see if your crust is browning properly. If so, just leave the oven at 375. 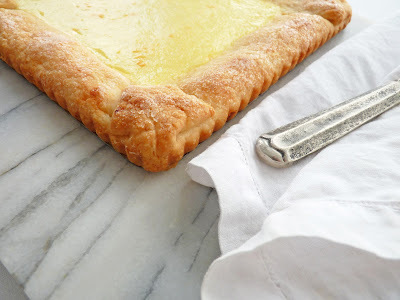 - If you don't have a 9" square tart pan with a removable bottom, use a 9" square metal baking pan and line it with a parchment overhang so you can easily lift it out. - Store leftovers in the refrigerator. I was kind of surprised to find that it's also good cold! To prepare the pastry dough, place the flour, sugar and salt into the bowl of a food processor and blend. Cut the cold butter into 1/2" pieces and add to the flour mixture. Pulse until the butter is the size of small peas, about 5 seconds. Add the cold water and pulse until the dough starts to clump, about 10 seconds. The dough will look a bit like small curd cottage cheese. Gather the dough and place on a sheet of plastic wrap. Form a disc and wrap tightly. Chill thoroughly. 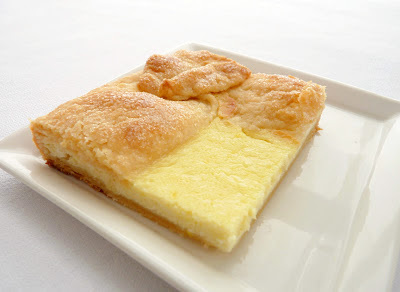 For the filling, whisk together the cream cheese, ricotta, sugar, lemon juice and lemon zest. Add a pinch of salt, to taste. Whisk in the egg. Chill the filling while you roll out the pastry dough. Unwrap the dough and let it rest on a lightly floured piece of parchment or work surface for just a few minutes. It needs to stay cool but warm up just enough to handle without a lot of resistance and cracking. Roll the dough out to about an 11" square and 1/8" thickness, gently lifting and moving the dough after each roll and keeping it lightly floured as needed. When you have the desired size, trim the edges and brush off any excess flour. Fold it in half and then again in half. Center the folded corner of the dough in a 9" square tart pan or baking pan. Unfold it and work it into the corners, leaving an overhang on all four sides. Pour the filling into the tart and spread it evenly. Gently fold the pastry overhang onto the surface of the tart. Chill the tart while you preheat the oven to 375 degrees. Brush the border of the dough with melted butter and dust with a light sprinkle of sugar. Bake for 25 minutes and then increase oven temperature to 400 degrees. Bake an additional 10 minutes until the dough is crisp and browned. Place on a wire rack to cool completely.